PORT HARCOURT – President Muhammadu Buhari Saturday disclosed that he does not have the constitutional powers to create cattle colonies in any part of the country under the Land Use Act of 1978. Buhari, however, assured that his administration is committed to laying foundations on which and egalitarian and progressive Nigerian, where every citizen can realise their full potentials without let or hindrance, could be attained. The president, who disclosed this in Port Harcourt at the South-South Zonal meeting of the National Committee of Buhari Support Groups, NCBSG, explained that said provisions of the Land Use Act gave powers to state governors and local government chairmen to control land in their domain. The President, who spoke through his Special Adviser on National Assembly Matters, Senator Ita Enang, mentioned that before independence there were cattle routes in the nation. He said: “Before Nigeria was formed as a country, we had cattle routes running from Chad, Niger and others down to the Atlantic. When Nigeria became four regions, we had cattle routes in each of the regions. “When Nigeria created states, each of the states made laws to regulate rearing of animals. In 1978, under Chief Olusegun Obasanjo as head of state, March 28, I think I am correct, the Land Use Act was made. Under the Land Use Act, the President of Nigeria has power to control lands in Abuja only. Buhari noted the commitment of his government to fight corruption prompted its actions in tackling theft, diversion and misappropriation of public funds, adding that his administration has diversified the nation’s economy for sustained growth. “Not only did we ease out of an inevitable recession in record time, our revenue profile, our foreign reserves and foreign investments are all on the rise again; and we have paid mobilized contractors back to project sites across the country, including the South-South Zone,” he added. Meanwhile, the former member of the House of Representatives, Hon. Ogbonna Nwuke, in his address noted that Buhari had proven to the people of South-South and South-East geopolitical zones that he is a friend and not an enemy. Nwuke, a chieftain of APC promised the President that the people of Niger Delta would vote him for second tenure if he contests. 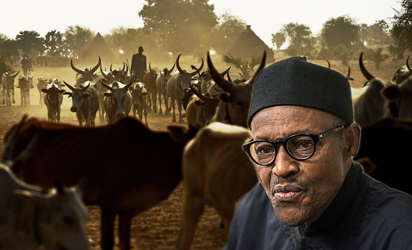 The post I don’t have constitutional powers to create cattle colonies – Buhari appeared first on Vanguard News.